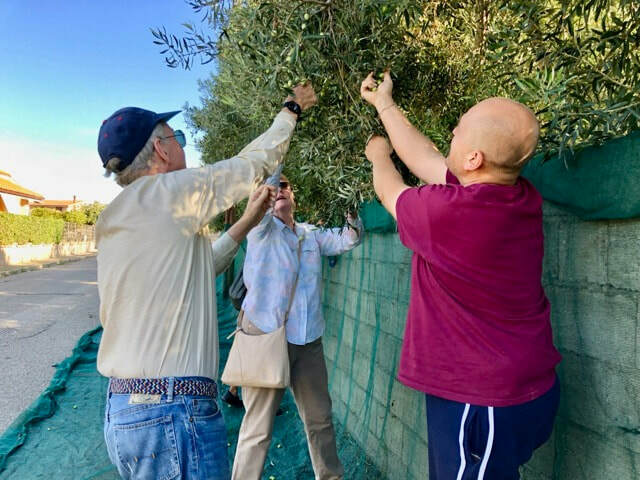 Pick olives and learn how to preserve them; take home your own jar of olives to share with friends. Taste the special wine of Oristano made from the local vernaccia grape, cultivated in Sardinia for 3500 years. Dough therapy making Sardinian bread. 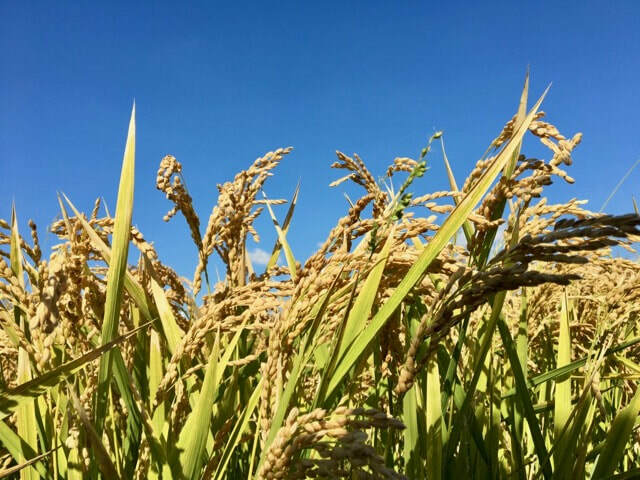 Visit a rice farm for the harvest and find out how rice gets from the field to the table. Make Sardinian sausages and BBQ them for lunch. 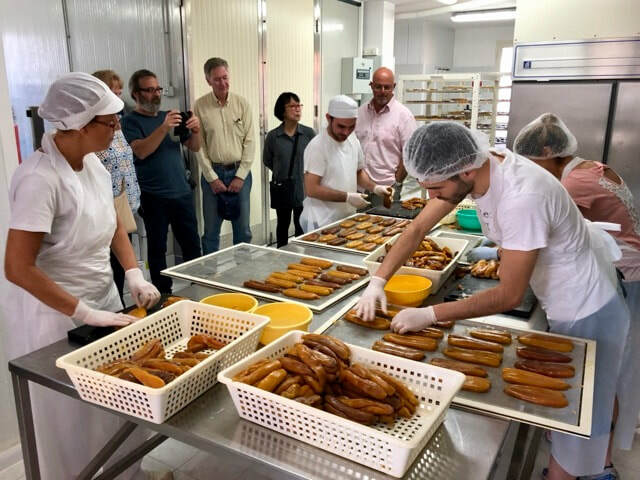 Follow the trail of bottarga from fresh fish to the final salted and dried roe, and taste this gourmet delicacy prepared in the producer’s restaurant. Visit a farmer who calls his farm a circular economy. 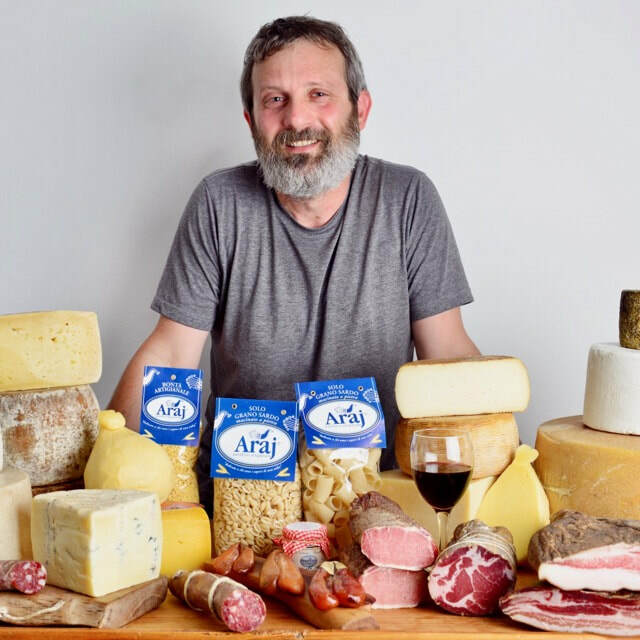 He grows fruit and vegetables, rears animals, slaughters them on the farm, makes cheese, salumi, pasta, fresh fruit juices. A lesson in how to be profitable while staying true to your principles. 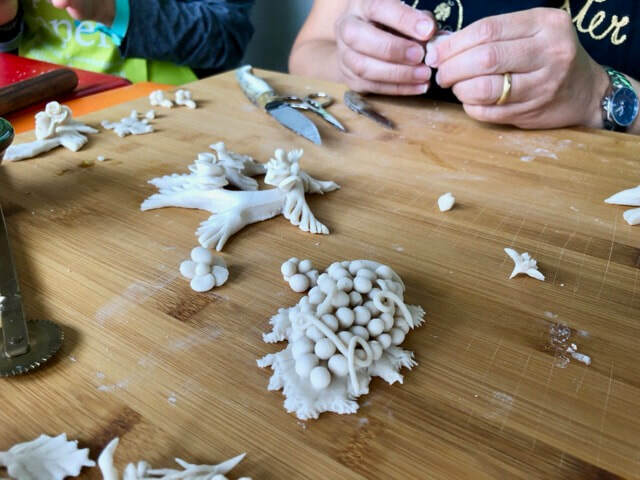 Become proficient at making culurgiones, potato-filled little works of art. Watch a shepherd making cheese and ricotta. 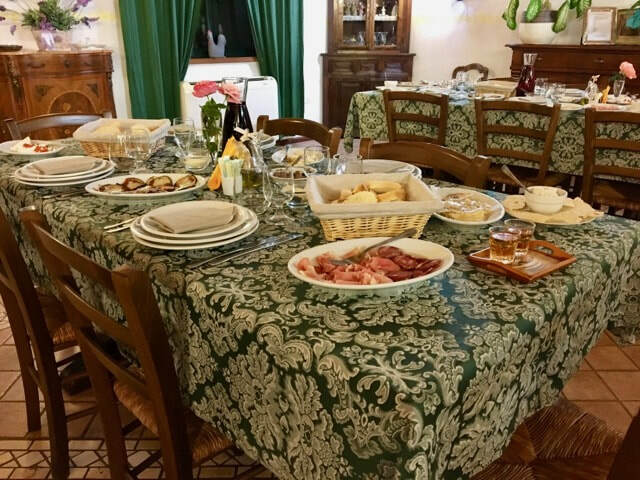 Eat like a Sardinian at our agriturismo where Giorgio creates his local cuisine with skill and love. 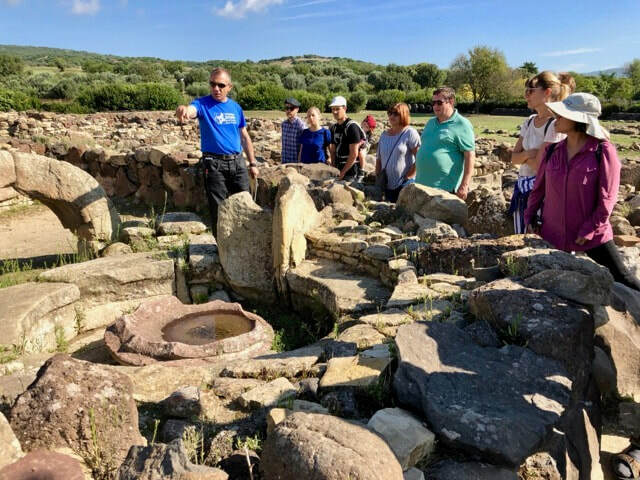 During your visit to the megalithic Nuragic site of Barumini, learn about the life of the people whose culture and society survived from 1700 to 200 BC. 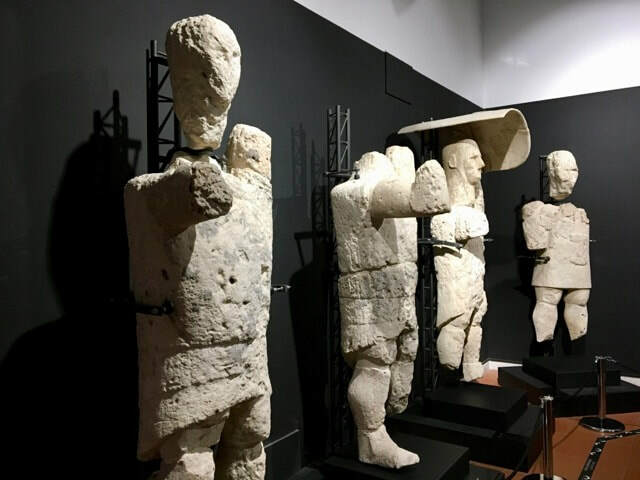 Encounter the sculptural giants of the Nuragic civilisation during a guided tour of the museum at Cabras. Free afternoon in Oristano, capital of the province where you stay. 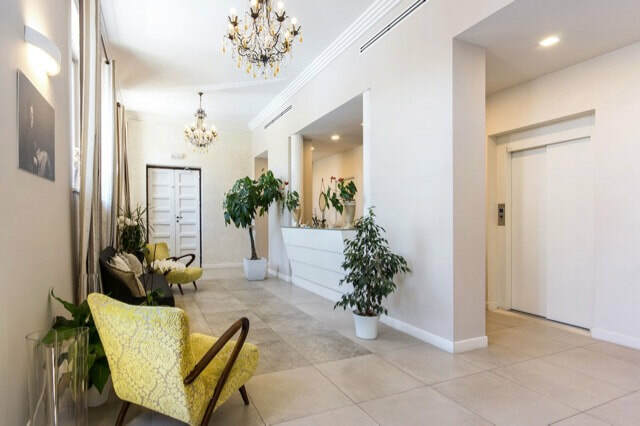 We meet at Il Gallo Bianco Hotel, only a 15-minute taxi ride from the airport or a 5-minute walk from the station (frequent trains from the airport). Aperitivo and introduction to the tour on the terrace of the hotel. Antonio and I are still deciding which of our two favourite restaurants to take you to for dinner. 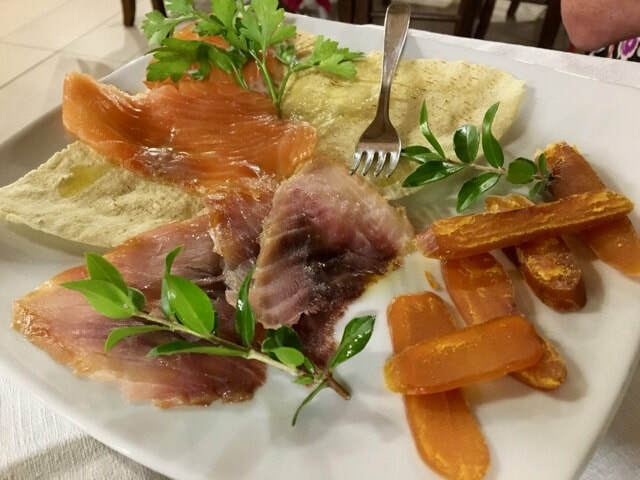 Whatever we decide, it will be a stellar introduction to Sardinian cuisine: things with strange names you may or may not know, like pane carasau, fregula, bottarga and malloreddus. ​Today we meet our first giant. 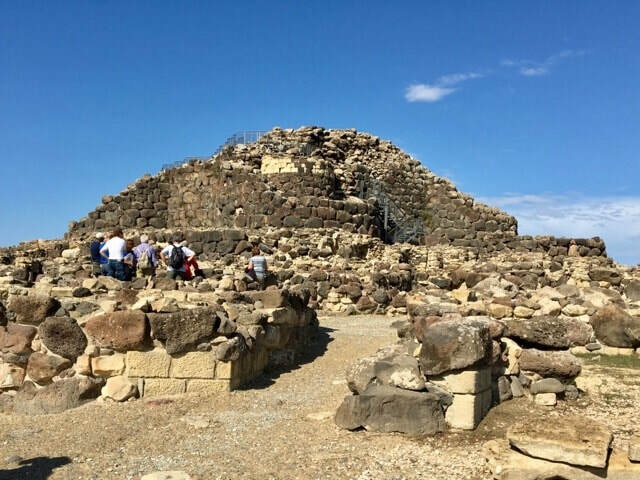 We head north from Cagliari to visit Barumini, a megalithic complex dating to the Bronze Age, one of the best preserved nuraghe on the island. Our guided tour takes us through the house foundations and massive towers. After a quick lunch, we visit the museum to see some of the artefacts found at the site. From here we continue to Agriturismo L’Orto at San Vero Milis in the province of Oristano, our home for the rest of the tour. 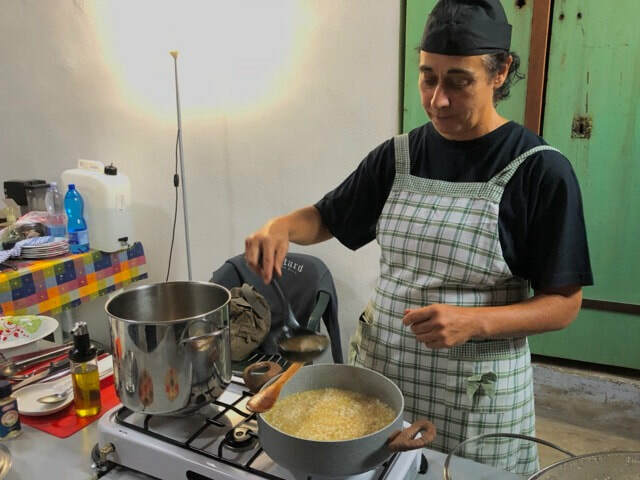 Francesca welcomes us to her farm and her husband Giorgio cooks us a typical meal from this part of Sardinia. He’s such a good cook that we’re looking forward to four dinners here. Giant number two today. 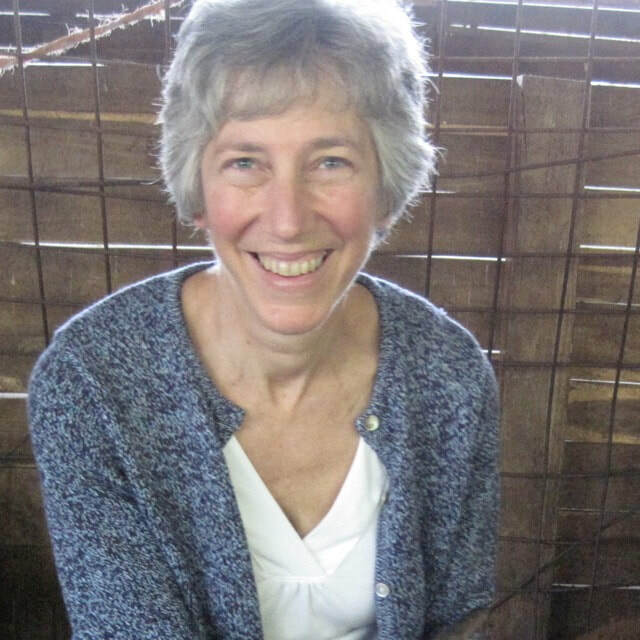 Actually, it’s a whole family which believes fiercely in sustainable agriculture and preserving biodiversity. Since it’s olive harvest time, we’ll pick olives, and learn how to cure them in brine. You’ll have a bottle to take home with you to show off to your friends. We’ll also make Sardinian bread and taste their wine made with local varieties of grapes, one of which has been there for 3000 years. We lunch at the farm. 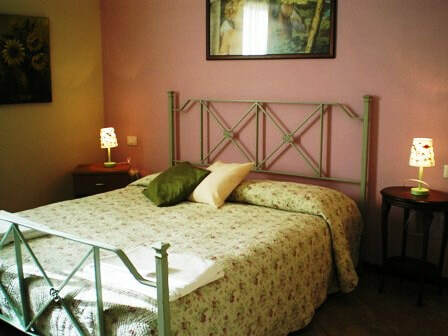 You have a free afternoon in the provincial capital of Oristano for sightseeing and shopping. 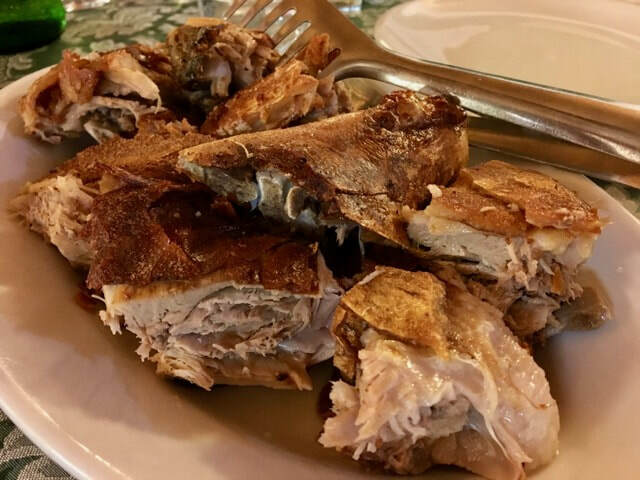 Dinner at Trattoria Gino in Oristano. ​Once you get your eye in, you see rice growing everywhere here. 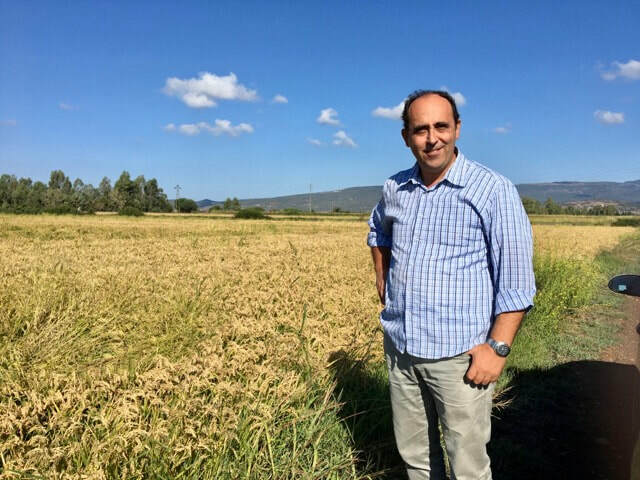 We visit Marcello Stara, in the midst of the rice harvest to find out how it’s cultivated, harvested, polished and, best of all, eaten. After a siesta, we go to find Pino and Claudia. 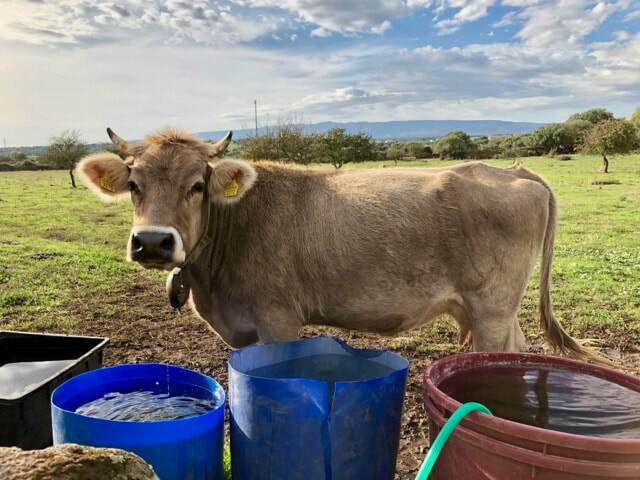 Instead of producing food, they’re seekers of the best Sardinian products, especially cheese. 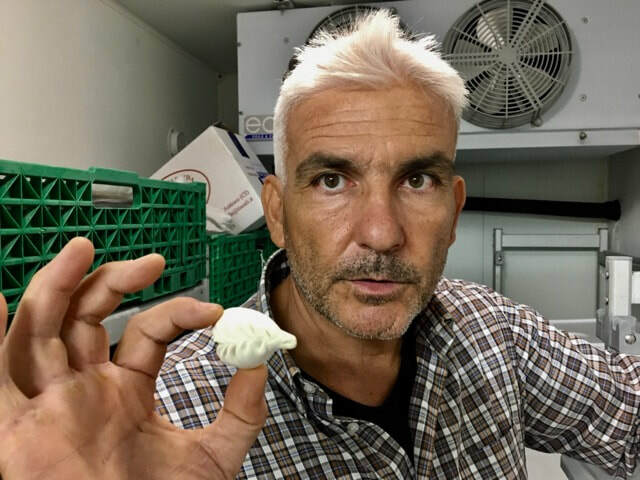 One of their shepherds will be on hand to demonstrate how he makes pecorino sardo (Sardinian sheep’s milk cheese). We’ll taste cheeses, salumi (cured pork), pane carasau (crisp bread) and wine. Given Pino’s enthusiasm, this tasting could go on well into the night. 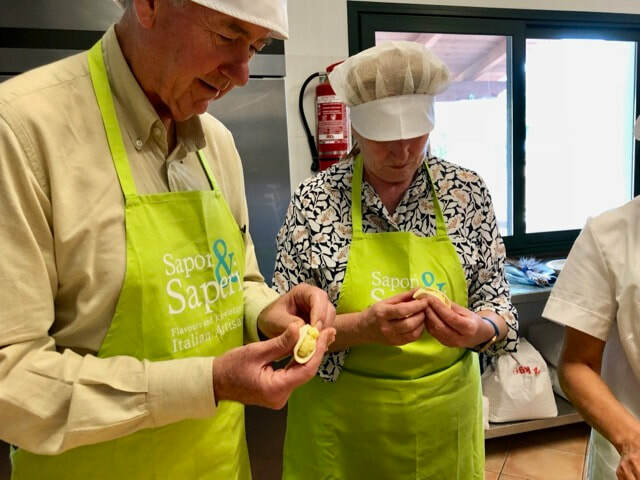 Today we go further afield to a sausage maker and his neighbour who cultivates saffron, peperoncino (chilli peppers) and oregano at Ussaramanna. 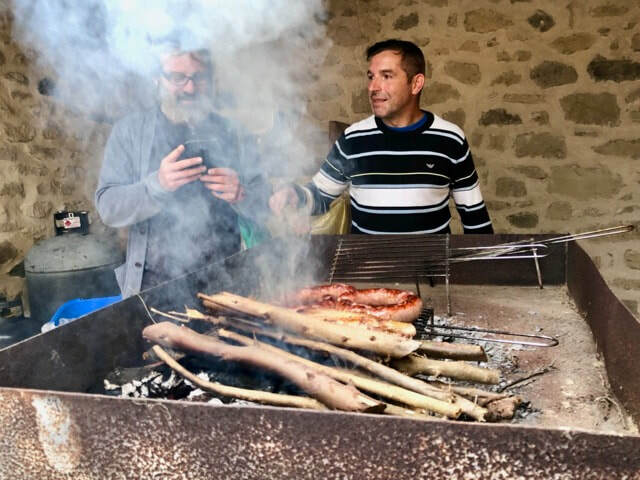 You’re going to make Sardinian sausages under the guidance of Paolo Lilliu. They can be grilled and eaten right away or air dried like salami. We’re going to BBQ them at the farm of his friend Sandro Picchedda, where we’ll also taste his saffron-flavoured delicacies and herbal teas. 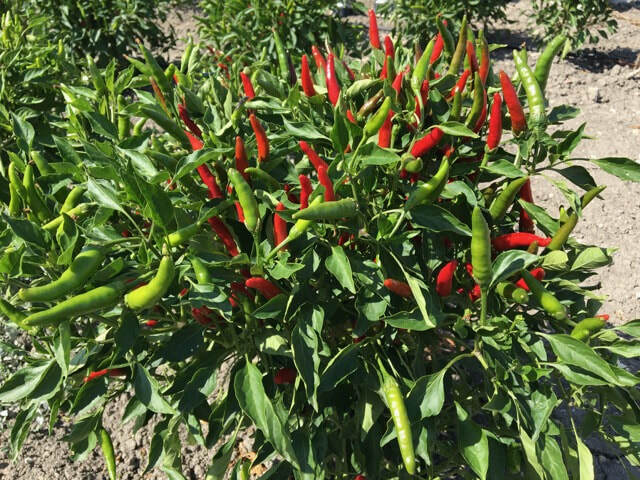 Although the new crop of saffron won’t be ready until November, the peperoncino fields should be a sea of red when we’re there. 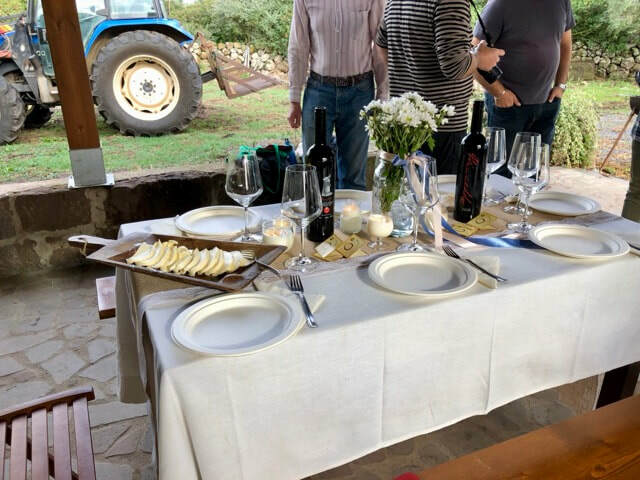 Back to our agriturismo for some down time before another delicious dinner prepared by Giorgio. Today could be wild. We’re up to giant number eight, and Sandro Dessé has such a huge vision that one never knows quite where he’s going to lead us. He champions the circular economy, keeping everything in-house. He rears goats, sheep, pigs, cows, donkeys and horses. He grows fruit and vegetables. 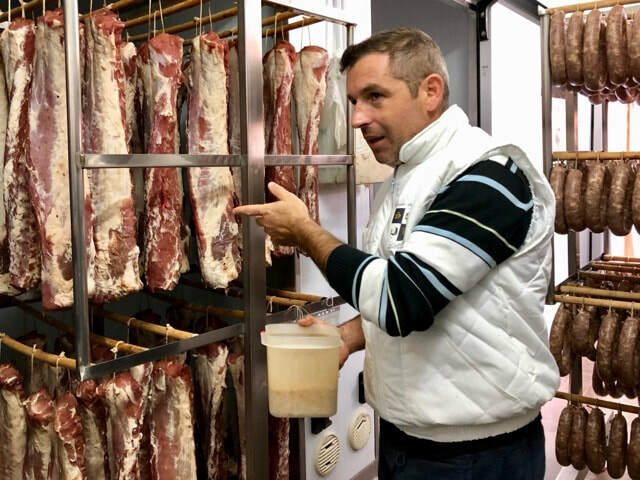 He has his own slaughterhouse, laboratory for cheese, one for salumi, a professional kitchen where he produces pasta to sell, a dining room that seats 250, four apartments he rents to tourists and a dinosaur park for children. The only things he hasn’t got round to yet are fish ponds and cereal cultivation. 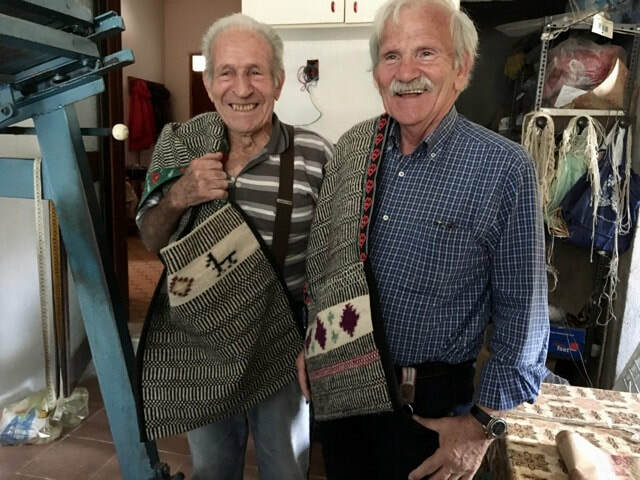 He has promised a tour of the farm, a lesson making culurgiones, a ravioli that looks like an ear of wheat, and lunch in that gigantic dining room. But who knows? If we don’t get co-opted to join his team, we’ll have some free time to visit one of the nearby attractions, to be decided by democratic vote. Friday is fish day. 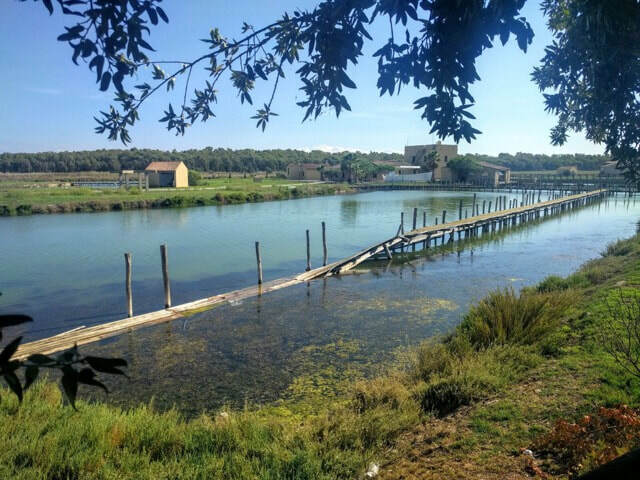 We have to be up early to get to Cabras in time to see the fishermen catching grey mullet, whose roe will be transformed into bottarga. 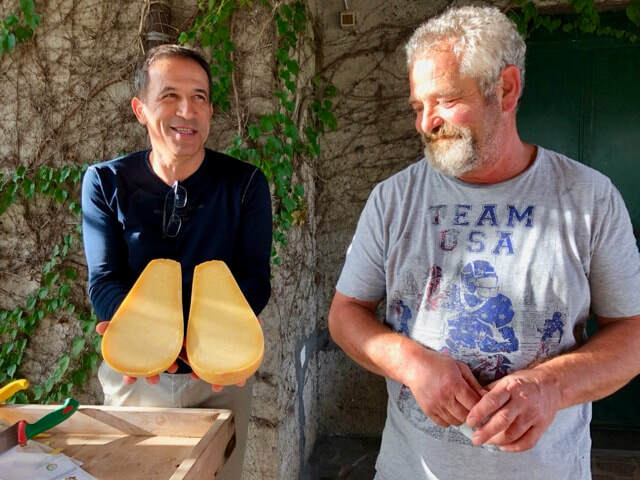 Bottarga is up there with gourmet products like truffles, caviar and Pisan pine nuts. At the Pontis Cooperative we’ll follow the fish through the cleaning, salting and drying process and finally into the dining room, where we’ll taste it in various formats during a fishy lunch. Cabras is also home to the nuragic warrior giant you see in the feature photo for this tour and several of his companions at arms. 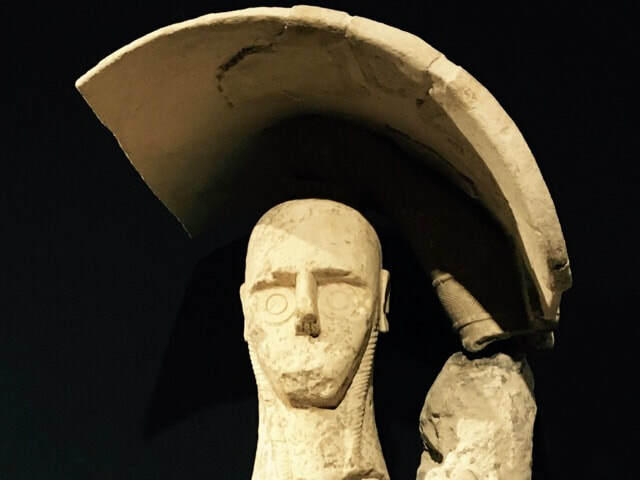 We have a private tour of the museum where you also see neolithic precursors of the nuragic civilisation and the cargo of a Roman shipwreck. Enough fish and sea for one day! For our farewell dinner at L’Orto we’ll feast on porceddu, Sardinian roast suckling pig. Departure from Agriturismo L'Orto around 9.00 am (or later if everyone prefers). Earliest arrival at Elmas Airport Cagliari at 10.30 am. ​Hi, I’m Antonio. I’m from Alghero in northern Sardinia, and I have been living in London 13 years. Since I have moved here, I have been working in the food business. I am a food importer, promoting and supporting Sardinian small family business in UK. 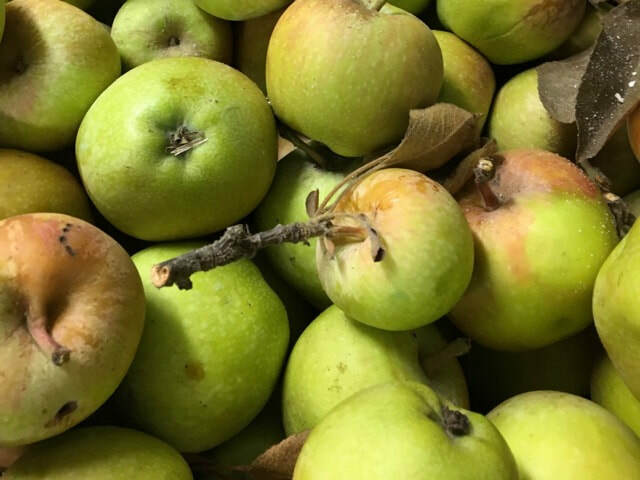 I sell via influential London food markets and I am creating a wholesale network in order to sell to local delis, restaurants and food enterprises sharing the same food ethos and also integrating a new concept concerning gastronomic cultural travels with the help of Sardinian enterprises devoted to hospitality and food. Local ground transportation for 8 days (includes one group transfer between meeting point and accommodation and one return after the tour). Please check with us before you book your travel to make sure it fits the tour schedule. Transfers at times other than those provided for the group will be at your own expense. Il Gallo Bianco hotel, Cagliari. Nearest airport: Cagliari Elmas, Sardinia (there are low-cost flights to Cagliari airport from international hubs outside Italy and from Rome and Milan among others). Please make your own way to Il Gallo Bianco hotel in Cagliari. The journey takes 12 minutes by train (€1.30) or 15 minutes by taxi (€25). Transport will be provided to Cagliari Elmas airport after 9.00 am. It takes 1 hour 15 minutes from San Vero Milis. The earliest you can arrive at the airport is 10.30 am, which means a flight no earlier than noon. If you need to travel earlier, a taxi can be arranged at your own expense. You must be fit enough to walk briskly on level farm tracks and stand for one or two hours during visits to producers and archaeological sites. Informal. Jeans or smart trousers are acceptable everywhere. 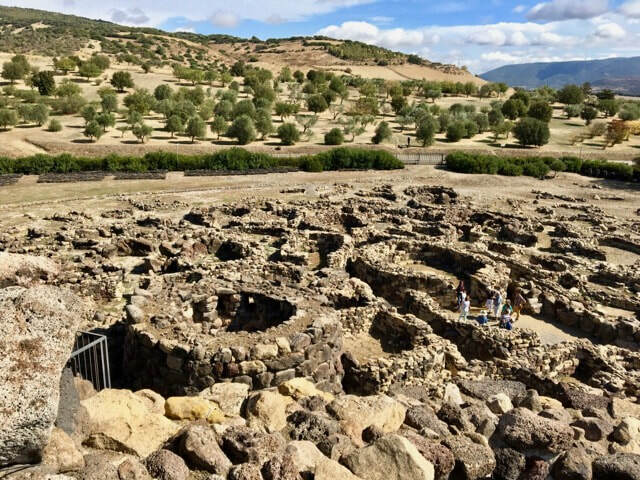 What an amazing in-depth experience of a little-visited part of Sardinia, full of Giants ancient and modern! 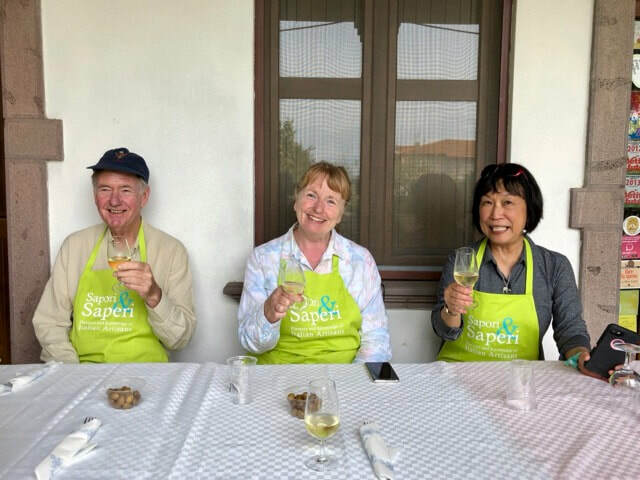 We were warmly welcomed into the homes and businesses of passionate producers of olives, rice, cheese, sausages, myrtle berries and saffron. Every day was full of warmth, conviviality and food! Many thanks to Erica and Antonio for their research, introductions, translations and knowledge.